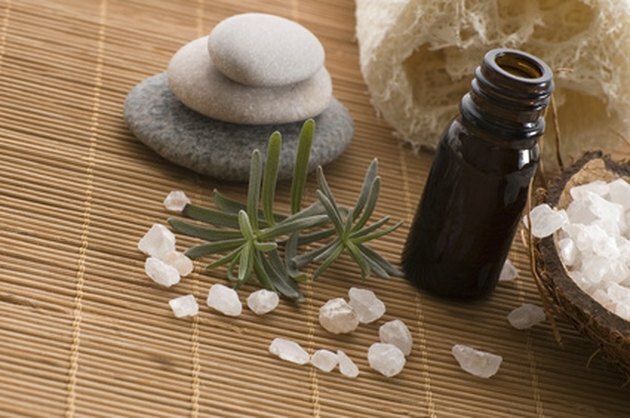 Sharon Falsetto is a certified aromatherapist who founded her own aromatherapy practice in Arizona in 2007. She has been writing professionally since 2008 and has been published in a variety of professional journals and e-zines. Falsetto is the Arizona regional director for the National Association for Holistic Aromatherapy and she has a degree in business from the U.K. Essential oils are used in the practice of aromatherapy to treat a number of health problems, including skin rashes and skin irritation. It is believed that some essential oils possess properties that are beneficial in reducing the symptoms associated with skin rashes. However, be aware that essential oils may cause different reactions in individuals. Pay attention to any contra-indications that are given for a particular essential oil. Consult a qualified health-care professional before using essential oils to treat skin rashes. According to the Mayo Clinic website, skin rashes are caused by viruses, fungi, bacteria, parasites, heat and even some forms of medication. Skin rashes cause itching, redness of the skin and pain, if left untreated. Common skin diseases that cause skin rashes include eczema, psoriasis, acne, rosacea and dermatitis. Essential oils are naturally extracted from plants and used in aromatherapy to treat the symptoms of various health problems. It is believed that essential oils possess a wide number of therapeutic properties. Essential oils that are suitable for treating skin rashes contain properties that are antiseptic, anti-viral, antibacterial and anti-infectious. Essential oils with these properties can help to calm the skin and reduce redness, itching and pain. Although essential oils are used to treat skin rashes and skin irritations, be aware that some essential oils themselves may cause skin irritation. According to Shirley and Len Price, in “Aromatherapy for Health Professionals,” essentials oils that contain a high percentage of the chemical components phenols or aldehydes usually carry some risk of causing skin irritation. Julia Lawless, in “The Illustrated Encyclopedia of Essential Oils,” lists a number of essential oils that are suitable for treating skin rashes. Essential oils such as lavender, Roman chamomile, rose, sandalwood, cedarwood, tea tree and geranium all contain therapeutic properties that may help to heal skin rashes. These essential oils are antiseptic, anti-viral, anti-infectious or antibacterial in their nature. However, consult a qualified health professional before using essential oils to treat skin rashes, as individual circumstances may differ. Always use a carrier lotion or carrier oil to apply essential oils to the skin. Add the appropriate essential oil to a white lotion base or a carrier oil, such as sunflower oil, for the treatment of skin rashes. If using a carrier oil, choose an oil that is light, as it is more easily absorbed by the skin. Apply to the affected area as needed. Test the lotion or oil on a small area of the skin before applying all over. Check with a health care professional too. Check the contra-indications of individual essential oils before applying to the skin, as some essential oils are not advised for use in pregnancy, with certain medications, with high blood pressure or with some other health conditions. The application of essential oils to treat skin rashes should not increase redness, itching, inflammation or pain. Stop using them immediately if this reaction occurs. Always consult a qualified health care professional before using essential oils. Are There Disadvantages to Aromatherapy?